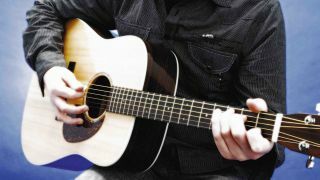 A chord is when you play two or more guitar strings at once, either by pressing down on the strings behind the frets or by leaving them ‘open’, ie, un-fretted. Open chords are simply chords that include open strings. More generally, the term also refers to chords played around the lowest three frets, aka the ‘open position’. Get started with the eight beginner ‘chord boxes’ shown below - these are pictures of the guitar fretboard with dots showing you where your fingers go. Numbers tell you which fingers to use: index finger is ‘1’, middle finger is ‘2’, and so on. Obviously your thumb is round the back - so it’s rarely used for fretting. Essentially yes, but you don’t always play all six strings. If you see an ‘X’ over a string in the chord box then you shouldn’t play it. An ‘O’ indicates an open string. If you’re strumming you’ll need to target the right strings with each pick stroke. Don’t worry if you can’t master this right away - it’ll come eventually. Yep! Most beginners find C and G a challenge. It takes time to develop dexterity in your fingers, so don’t lose heart. If you’re really struggling with a particular chord, try fretting just the highest three or four strings (highest in pitch, ie, the thinnest strings) for now - you’ll improve the more you play. Experiment with some ‘chord changes’: choose two chords and swap between them. C and Am sound great in sequence, or try A and D for a brighter sound. As you gain confidence try longer chord sequences and have a go at ‘down-up’-style strumming. We’ve written a rhythm in guitar tablature for you. A root note is the open or fretted note that a chord takes its name from. For example, E and Em chords have E as their root note. C, A, G, E and D are major chords with a bright, happy sound. Am, Em and Dm are minor chords (the lower case ‘m’ tells you this) and are darker and moodier. Black dots are root notes; red dots are other notes that make up the chords. The staple symbols under the tab tells you to play downward pick strokes. The ‘V’ is for upstrokes. Listen to the audio track to hear how it should sound.